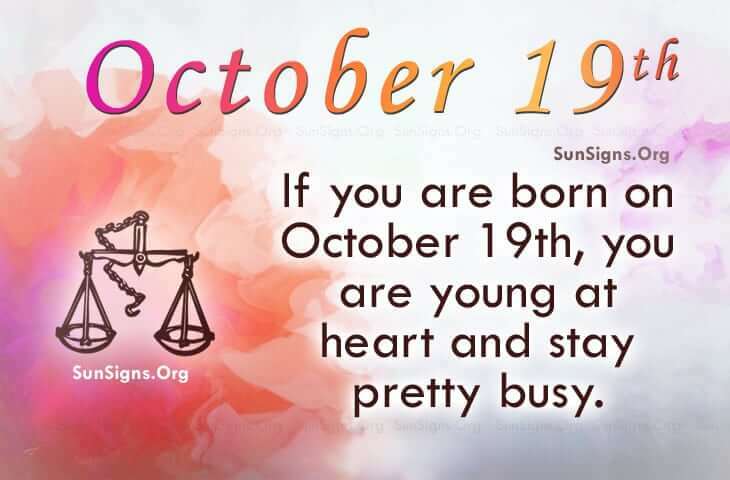 Famous people born on OCTOBER 19 could be guilty of not taking care of themselves like they should. However, they’re young at heart and stay pretty busy. This helps but does not take the place of a total physical work-out. They could benefit from balanced meals and supplements to aid their immune system in working for them to fight illnesses. Their personality is highly regarded as being caring, adaptable, and full of honey. Because of this, they get a lot of attention and they may find that there are a few people who are without a doubt envious. Famous celebrities born on October 19 are naturally secure with themselves. They are Libra who take care of business. They don’t take many chances with their money. However, in business they may have to invest money to make money. They take note of what works and what doesn’t mainly by making their own mistakes. So, they need to be confident in themselves and go for it. Famous people born on OCTOBER 19th are charismatic Libra. Some people could be jealous of their energy and their beauty. They do not fool around with money but like helping people who are not as fortunate as them.